Amidst all the fanfare about CHC kicking off Project ECHO® in Connecticut and the discussions about innovative use of telemedicine to improve health outcomes, it could be easy to lose focus on what truly matters, the patient. Yet CHC is a Patient Centered Medical Home, which is more than just a nice title added to the website, and the patient centered aspect shone through in the first Project ECHO teleconference. Yes, there were the introductory speeches, the photographers and the press, but the center of Project ECHO was talking about how the whole team at CHC could work together to help specific patients fighting HIV and Hepatitis C.
The expertise shown by Hepatitis C and HIV specialist Dr. Marwan Haddad, Assistant Clinical Professors at the University of CT School of Pharmacy, Dr. Stefanie Nigro and Dr. Marissa Salvo, and others came as no surprise. They used the cases presented to discuss issues that primary care providers should be aware of as patients start off on treatment programs for Hepatitis C and HIV. Yet what is often overlooked is that there are many other issues that patients embarking such treatments, especially those from underserved populations, that need to be addressed. Many of these are logistical issues. How do patients get help making sure their treatments are covered? How do they get to the office for appointments? How do they find enough stability in their lives to sufficiently comply with their treatments over an extended period to make them successful? 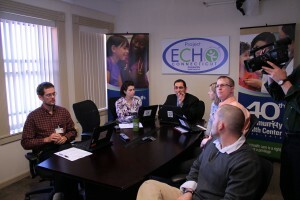 The kickoff Project ECHO teleconference illustrated the importance of telemedicine in a patient centered medical home context, not only by improving access for primary care providers to experts in hepatitis C, the biochemical mechanisms of action of drugs, and the psychological impacts of disease treatment programs, but to folks who can help patients navigate complex logistical issues in the treatment. When we look at things this way, we see the importance of a patient centered focus. It is important to have specialists help primary care providers in treating chronic conditions, but what really matters is when everyone works together to make sure the patient receives all the help and treatment they need.